RUSH: The NAALCP, ladies and gentlemen. 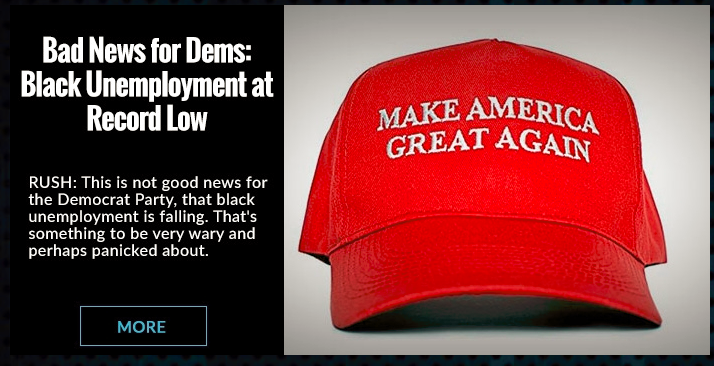 Remember, now, African-American unemployment has hit a record all-time low under President Trump. African-American unemployment is at an all-time low. African-Americans have been voting for Democrat candidates for over 50 years. The Democrat candidates have been promising to do all of these wonderful things and get rid of all the evil white racists and you name it. And after every election, after all these 50 years, African-Americans continue to complain about the things they’ve been complaining about for 50 years, even after eight years of the first African-American president, where African-American unemployment was sky-high. Now, after just one year of Donald Trump, African-American unemployment has hit a record all-time low. And so the NAALCP wants fans at the college football game tonight to protest President Trump by waving white towels. National championship on the line tonight, University of Georgia, University of Alabama. The Atlanta chapter the NAALCP wants fans inside the stadium in Atlanta to wave white towels simulating a blizzard. You people at the NAALCP, you might want to check history. Waving white towels is a sign of surrender. You may want to rethink the color of the towels. It’s one of several anti-Trump protests planned as Trump visits Atlanta tonight to attend the showdown. The NAALCP is urging people to hold anti-Trump signs and wear white to mock the snowflake label that Trump supporters use to describe their opponents. I’m telling you, you start waving white clouds around, white flags, white this, people are gonna think you’re surrendering.